Overlooking Saiboo Street in Robertson Quay, Satsuma is perched on the upper floor of one of the three large cylindrical glass and steel structures, which are attached to Gallery Hotel. 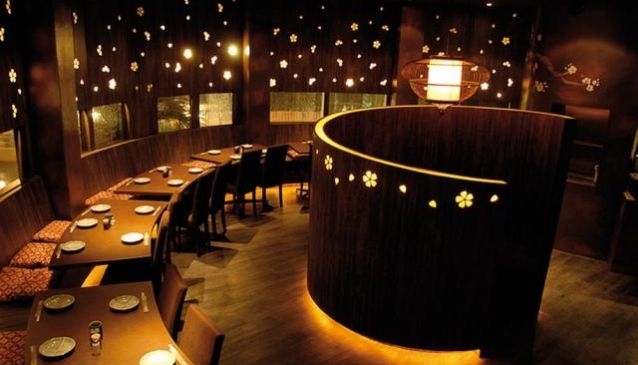 The round shaped building has the look of a defensive tower but Satsuma's wooden interior design with its pink and red mural cherry tree adorning the wall of an enclosed tatami space, create the perfect atmosphere of cosiness and warmth for a romantic dinner. Satsuma is very popular for its creative cooking and traditional charcoal grill cuisine such as oyster rolled with pork, Japanese mackeral with plum and prawn with sweet miso sauce. Some other standouts include the creamy salmon & avocado tartare, yellowtail with truffle oil dressing and sweet eggplant with miso which are simply scrumptious. You'll also appreciate the freshness of the produce, seasonal dishes and the knowledgeable and attentive staff. Satsuma is also the place where you can have a Japanese drink such as bier, sake and most importantly, choose from 100 labels of shochu - a well-known Japanese alcoholic beverage. Satsuma is the first and only shochu specialty Japanese restaurant in Singapore.